An original Disleyland D Ticket, which gave access to some great rides. Sadly the film ‘Tomorrowland’ isn’t one of them. The image above is from an original D-ticket from Disneyland. E-tickets were the best, but the D-tickets were pretty good. 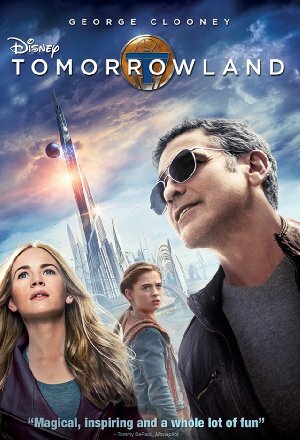 Sadly, the Disney film that takes its title from the park’s futuristic area, Tomorrowland earned a D-ticket with the D standing for disappointing. The film opens with “Frank Walker” (George Clooney) attempting to record his telling of a story. Eventually “Casey Newton” (Britt Robertson) tells it from her perspective. It involves a younger Frank Walker (Thomas Robinson), a man named Nix (Hugh Laurie) the younger version meets at the 1964 World’s Fair, and a young girl named “Athena” (Raffey Cassidy) he also encounters there. Frank has an invention he wants to enter into the Fair’s competition. It’s a jet pack he built himself. Unfortunately it isn’t quite perfected. Fast forward to a point in the future and we are introduced to “Casey Newton” (Britt Robertson), daughter of a NASA engineer (Tim McGraw) who is working on the deconstruction of a launch platform. Casey is doing her best to keep that platform alive and runs into trouble. She also comes in contact with Athena, who gives her a glimpse into a world of wonders far beyond her experience. Events take place that bring Casey and the adult Frank together and they journey to this world, along with Athena, in order to prevent a cataclysmic end to life on Earth. Writer/director Brad Bird has created some masterpieces in animation (The Incredibles, Ratatouille) but his work here is nowhere near that level of quality. This is a film with extremely uneven pacing, and aside from the tremendously entertaining special effects, little else to recommend it. George Clooney, winner of one Oscar and three other nominations for his acting works is an astonishingly talented actor. That makes his performance here much more disappointing as he seems to be just going through the motions. Hugh Laurie’s role as “Governor Nix” doesn’t give him much to do and while Britt Robertson is very good, she just isn’t ready to carry an entire movie on her shoulders. Conversely Rafferty Cassidy is a joy and is a lot of fun to watch. Roger Ebert reviews ‘Killing Them Softly’… and gets major plot points wrong!